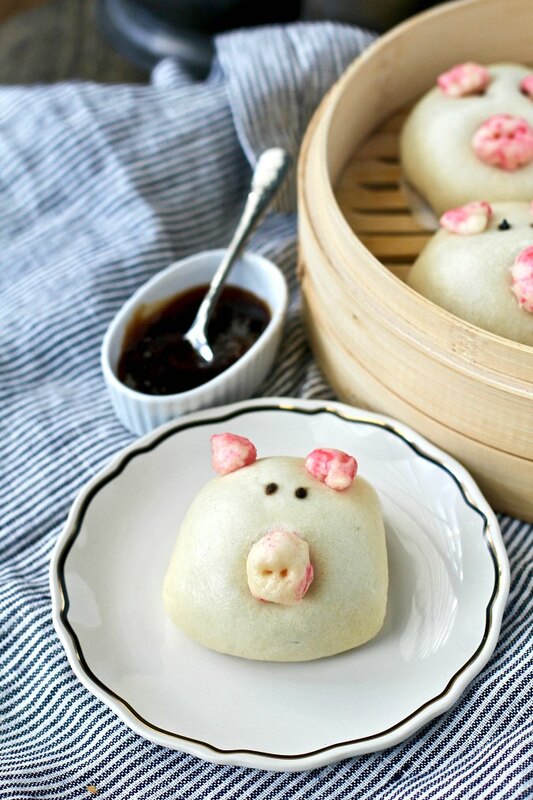 These steamed piglet buns, with a barbecue pork filling, are such a cute surprise emerging from your bamboo steamer basket! 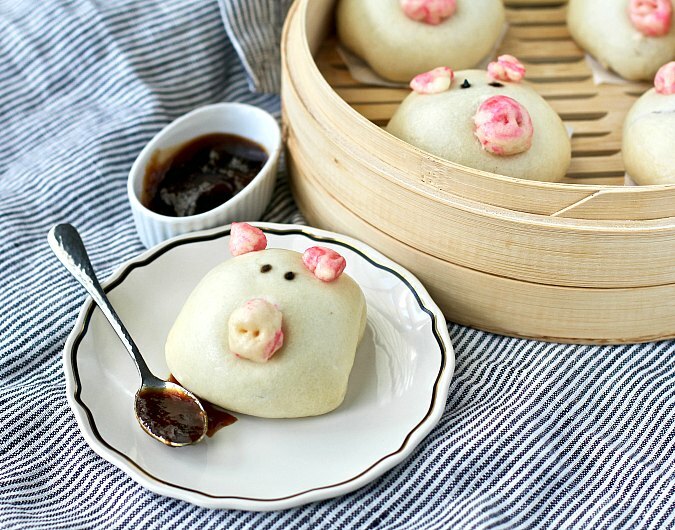 This was my first time making these little steamed piggy buns, but they were easier to make than I expected. I had a little bit of experience making steamed buns and I made the same dough that I used for these steamed buns. I just had to learn how to make little pink noses and ears and attach them to the dumplings. I guess incorporating the coloring into the dough is similar to coloring fondant, something I've never done either. Next time I'll build in the time to really incorporate the color. You could also just skip the color altogether and I think they'd still be pretty cute. I tried to do floppy ears by folding one edge under, and a few of them developed a mind of their own, which I don't mind either. If you'd like more precision, just flatten the dough and cut triangles with a knife and place them flat on the piggies. To make the nostrils, I used a broken toothpick. For the eyes, I used black sesame seeds. Just pick them up with one fingertip (it will stick) and place it on the pig's face. Then use the toothpick to gently press the sesame seed into the dough. Just remember that the noses and ears will grow quite a bit in the steamer. 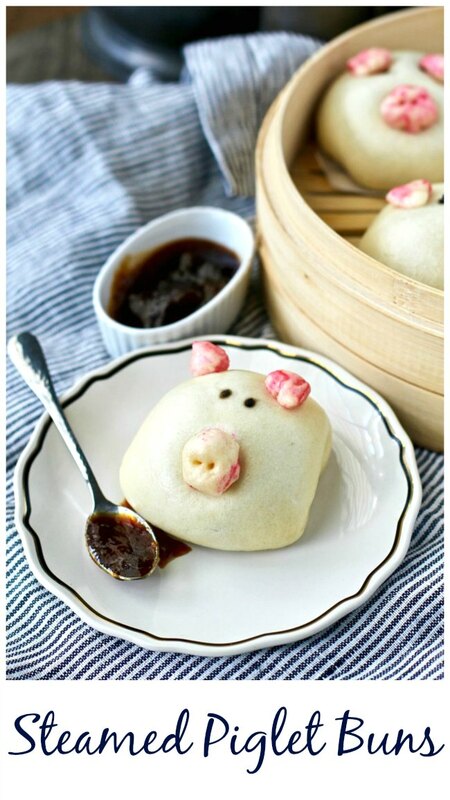 You can use your favorite Chinese dumpling filling for these buns, or make them without filling by forming them into balls (they will be smaller) and dip them in sauce. I filled these with a cabbage, pork, and barbecue sauce mixture, and also dipped the buns in some of the sauce. Note: Be sure to use a thick Asian-style barbecue sauce for the filling. I actually used a standard spicy barbecue sauce I had on hand and doctored it up with some Hoisin sauce. The results were delicious. Bamboo steamer: I use this 10 inch bamboo steamer. You can even buy two sets and stack them up on top of each other. Fourteen inch flat bottomed wok: The wok will hold the steamer above the water. Both the steamer and the wok are relatively inexpensive. I love mine. How do these piggy buns taste? They are an absolute treat! The dough is soft and slightly sweet and pairs so well with the tangy and spicy pork. They're perfect for a dim sum party! 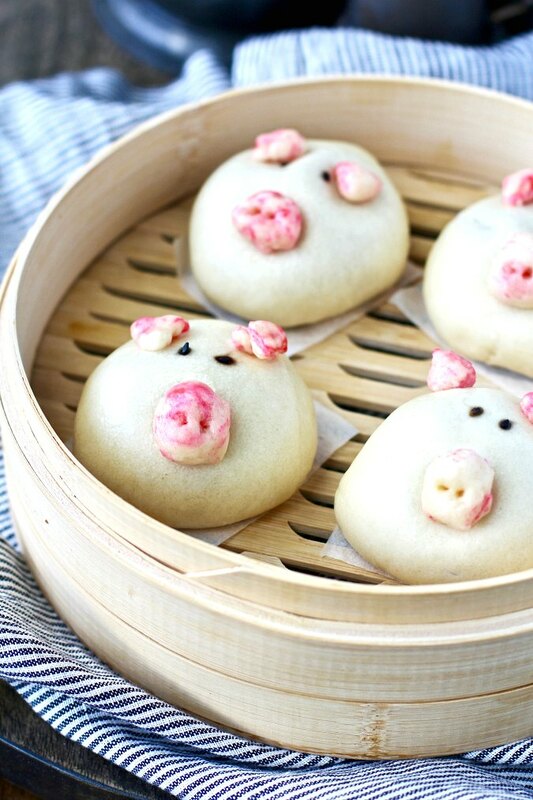 After steaming these piggy buns, let them cool. Then individually wrap them and place them in a freezer bag and freeze them. You can then re-steam them for 5 minutes straight from the freezer. Another option is, after shaping the piglets, to place them on a sheet pan and cover them with plastic wrap and place them in the refrigerator for up to three hours before steaming. Remove them from the refrigerator about 30 minutes before steaming. This month, the Bread Bakers are making Good Luck Breads, a theme chosen by Felice from All That's Left Are The Crumbs. Did you know that pigs represent good luck and wealth in many cultures? On top of that, the Chinese New Year is February 5, ushering in the year of the pig! Add the yeast, flour, sugar, and baking powder to the bowl of a stand mixer and whisk to combine. Mix the water and oil in a measuring cup. Using the dough hook, begin mixing the dough while slowly pouring in the water and oil. Mix on low until you have a shaggy dough, adjusting the water as necessary. Mix the dough on second speed for about 6 to 8 minutes until you have a springy dough. Cover and let the dough rise until doubled, about an hour. In the meantime, cut 16 three-inch squares of parchment paper. Divide dough into 17 equal pieces and form 16 of them into 1 inch thick round disks. Cover the dough you are not shaping with oiled plastic wrap. Roll a piece of dough out into a 5 inch round and place 2 tablespoons o the filling in the center. Fold the dough over the filling, forming a ball, and seal with a bit of water. Place the ball, seam side down, on one of the parchment squares. Cover with oiled plastic wrap. Repeat with the other 15 pieces of dough. Knead the food coloring into the 17th piece of dough and form small pieces into 16 noses and 32 ears. With a bit of water, stick the noses and ears on the balls. Use a toothpick to poke the holes in the noses for nostrils. Add the sesame seeds for eyes as pictured. Cover the piglets with oiled plastic wrap and let rise for 20 minutes. Place the buns with their parchment in the steamer, 2 inches apart. Bring about 3 inches of water to a boil in the wok. Just before steaming, use the toothpick to redefine the nostrils. Place the steamer over the water (the water should not touch the bottom of the steamer, but be just below). Steam for about 13 to 15 minutes. Turn off the heat and let the buns sit for about 2 minutes. The dough should be shiny. Serve immediately with barbecue sauce. Place the cabbage into a colander and mix with 2 teaspoons of the salt. Let sit for about 10 minutes. Squeeze excess liquid from the cabbage with your hands. Roll the cabbage up in paper towels to remove as much remaining liquid as possible. In the bowl, mix the cabbage, pork, bacon fat, pepper, barbecue sauce, and 1/4 teaspoon of salt with your hands. Cover and refrigerate until cold. Use to fill the buns. Hello Karen, I absolutely loved your piggy buns. It seems to be a lot of hard work but definitely rewarding. The marbled effect on the ears and nose is beautiful.The stuffing sounds yum. They are an absolute treat. Thanks so much. It was actually easier than expected! OMG they look so adorable and cute. I would love to try this. Bookmarking your recipe. Love that this pigs are filled with pigs....excellent choice Karen. How cute will these be at a potluck? Thanks for sharing. It had to be pork!! They'd be so fun at a potluck! Excellent work Karen. These piggy buns are looking absolutely stunning. Couldn't wait to see your little piggies, Karen, and my patience was rewarded. They are adorable. And, knowing you, also delicious. Thanks so much Stacy. They were pretty tasty! you hit the jackpot with this bake! Oooh. Turkeys filled with turkey!! These are such cute little piggies, love them. Your little piggy steamed buns are simply the best. 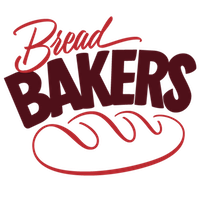 You are such a talented baker and I am honored to be able to learn more about bread baking from you.